If you plan to take the "Direct Flight" to Boracay, be prepared for a very unpleasant and harrowing experience aboard Pacific Air's prop planes. I like to call them "Tonka Trucks in the Sky". The first photo is the landing strip. There were carabao grazing next to the runway. The "terminal" is a cement and bamboo box that doubles as an impromptu shelter for stray dogs. But once you get to Boracay the water is clear and beautiful and the sand as white and soft as baby powder. 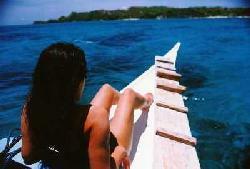 We hired a private boat for four hours for 600 pesos ($15) which took us to secluded coves and remote beaches. The most photographed spot on Boracay is "Willy's Rock". We just took that photo for the heck of it. There are quite a few gorgeous resorts on the island. There are also alot of places that call themselves "resorts" but are only basic nipa hut type lodging on a plot of land. We stayed at a beautiful place called "Garden Paradise". Manicured lawns, a luscious pool and hot showers with a very friendly and attentive staff. Other good places to stay are Lorenzo's and Crystal Sands. They are also the most expensive but well worth the price. Three days and two nights on a weekend, including flight, lodging and breakfast cost us $200 each.